When we first got word that Robert De Niro (Raging Bull) and Sylvester Stallone (Rocky) would meet in the ring as aging boxers in Grudge Match, we were curious as to what shape they both be in. Now, thanks to the first image from the set, we have a pretty good idea. They look a little bloody and beat up, but in more than decent enough shape to knock in the teeth of your average movie blogger. Also starring Kim Basinger, Peter Segal’s Grudge Match opens this November 15th. Hit the jump to check out the first look at De Niro and Stallone. 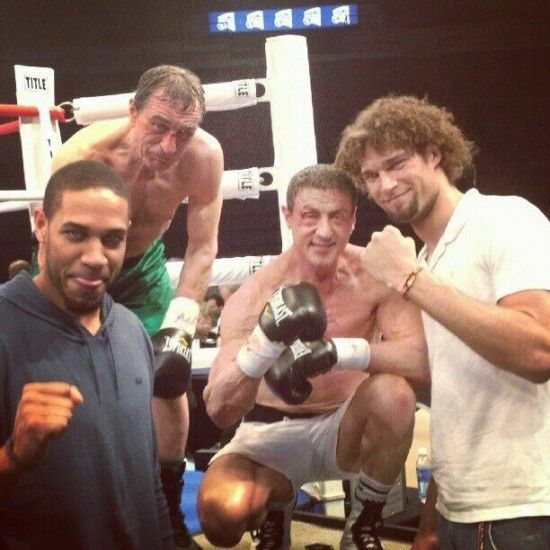 NBA star Robin Lopez on the set of “Grudge Match” w De Niro and Stallone. The Tim Kelleher screenplay follows two boxing rivals, Billy “The Kid” McGuigan and Henry “Razor” Sharp, both now in their 60s. They agree to get back into the ring for a rematch decades after their last title fight. Kevin Hart (The 40 Year Old Virgin) also co-stars as a fight promoter.